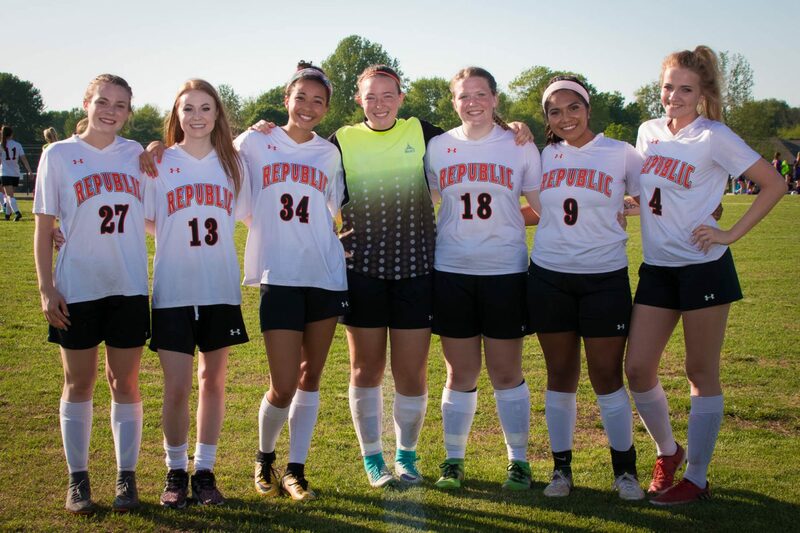 Republic honored its senior class, then stepped up to throttle Monett 4-0 in their final game of the regular season. Tara Campbell and Bella Drennan combined in goal for another shutout, and Clara Fronabarger scored another hat trick for Republic. Madi Mitchell also had a goal. The Lady Tigers scored their first two goals in quick succession, starting in the 17th minute, when Fronabarger knocked her first one in. Two minutes later, Mitchell scored to make it 2-0. It stayed that way until the half was almost over, when Fronabarger scored again to give Republic a 3-0 lead. The Lady Tigers dominated possession from start to finish, but didn’t score again until Fronabarger’s third goal in the 72nd minute. Before the game, Republic recognized its seven seniors. Coach Kevin Hauck says a couple of things stand out about this senior class. Senior goalkeeper Tara Campbell had an eventful night, suffering an injury early in the second half that forced her to the sideline. But she recovered in time to return to the game — not in goal, but as a forward. Fronabarger says the offense was clicking, giving her and her teammates lots of good scoring opportunities. In addition to her three goals, Fronabarger added an assist. Sarah Hicks also assisted on one goal. The JV Lady Tigers won 4-0. They ended their season with a 9-6-3 record. The varsity Lady Tigers end their regular season with a 13-6 record. Eleven of those wins were shutouts. They will host districts next week, starting Tuesday with a game against Branson. Ask coach Kevin Hauck what he will remember about this year’s senior class and two things pop into his head: hard work and family. The Lady Tigers honored their seven seniors before taking the field in a win over Monett, and Hauck says this group will have a lasting effect on the program. For their contributions over the years, the 2018 soccer seniors are our Farr Better Players of the Game.